The recumbent bikes of Life Fitness feature a perfect comfort, innovative training programs, and excellent quality. 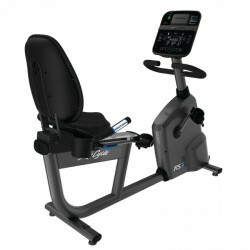 Life Fitness presents three series of recumbent bikes for an effective and comfortable recumbent bike training. 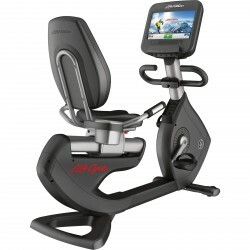 The recumbent bikes RS1 and RS3 present the Life Fitness RS series. Both models convince by their excellent ergonomics, the comfortable deep step-through, and open design. Thanks to the well-thought out frame build, getting on and off is easily done. Both models are equipped with an electro-magnetic induction brake and a 10 kg flywheel, which provides a smooth concentric run. The training resistance is variable in 20 levels. In addition, the RS3 is equipped with a built-in generator. The generator system supplies the machine with the required energy and allows a free place set-up. The seat is a distinctive difference of both models. While the RS1 offers a horizontally adjustable standard recumbent seat with back upholstery, the RS3 surprises by a luxury mesh recumbent seat with a 13 times horizontal seat adjustment. Furthermore, the breathable backrest of the RS3 is adjustable in incline. The important details provide more comfort and allows an optimally comfortable sitting position while exercising. Due to their perfect ergonomics, recumbent bikes of the RS series are ideal for older users or persons with limited range of motion. 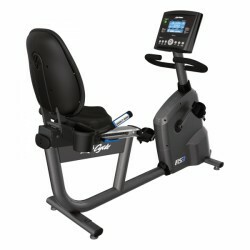 The recumbent bikes RS1 and RS3 are available with the Go console or the Track Plus console. The Go console offers 13 training programs and the Track Plus console offers 14. 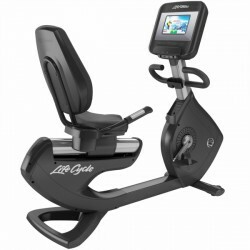 Providing 5 heart rate controlled programs, both consoles allow a pulse controlled recumbent bike training. You can either use the hand pulse sensors or the provided chest strap. Compared to the Go console, the Track Plus console can be connected with Apple devides or Android compatible Smartphones and Tablets. That means that you can personalize your training and track your training results. The recumbent bikes of the Club Series and the Platinum Club Series Discover are especially designed for an intensive use at home. They surprise by their excellent stability, special sturdiness, and numberless training programs. 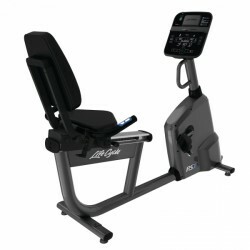 The Life Fitness recumbent bike of the Club Serie guarantees durability, performance, and comfort of the award-winning Life Fitness commercial model. The ergonomically shaped recumbent seat with high backrest, individual seat adjustment, and comfortable Wide Ride™ pedals are just some features, which ensure an excellent training comfort. The Club Series console also gives all important training data, i. e., current resistance level, training time, distance, pulse, and current calory consumption. In addition, the Club Series console is equipped with an iPod docking station for controlling, playing, and charging your iPod. 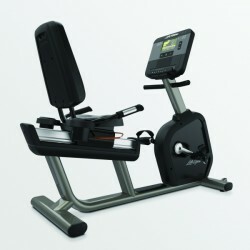 The Platinum Club Series Discover recumbent bike is something special of the famous Life Fitness brand. Weighing 97 kg, the recumbent bike is even more stable and thanks to the Comfort Curve Plus recumbent seat even more comfortable compared to other models. Due to the electro-magnetic brake system, the course of motion is smooth and soft. 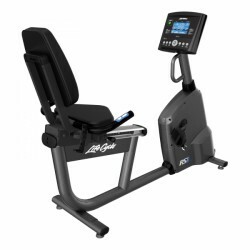 In contrast to the Club Series recumbent bike (25 levels), the training resistance of the Platinum Club Series Discover is adjustable in 26 resistance levels - for doing a more intensive and more effective training. 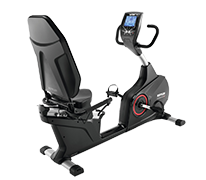 The Platinum Club Series Discover recumbent bike can be used for individual workouts with the Discover SI or the SE console. Both consoles are compatible with Apple devices and Android Smartphones and offer numberless entertainment possibilities while exercising. Using the free LFconnect website, your training becomes an unforgettable experience. The Discover SE console differs from the SI console by being equipped with a 16 inches touchscreen display with integrated tv. The Discover SI console has a 10 inches touchscreen display.